Go to original pattern for design DROPS Children 28-2. 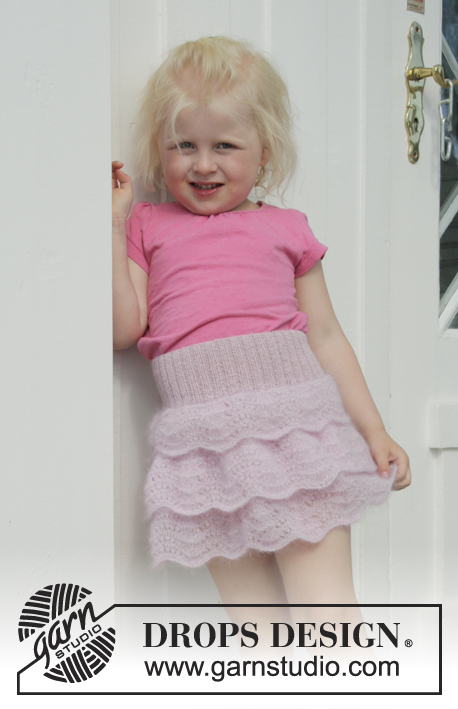 Knitted skirt with wave pattern, flounces and rib in DROPS Kid-Silk and DROPS Alpaca or DROPS Safran. Size children 2 - 10 years. 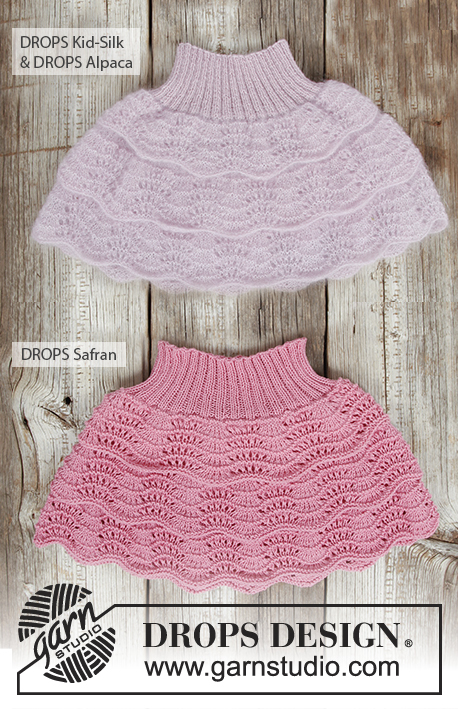 DROPS CIRCULAR NEEDLE (60 cm) SIZE 3 MM – or the size needed to get 24 stitches x 32 rows stocking stitch on 10 x 10 cm. DROPS CIRCULAR NEEDLE (60 cm) SIZE 2.5 MM for rib – or the size needed to get 26 stitches x 34 rows stocking stitch on 10 x 10 cm. 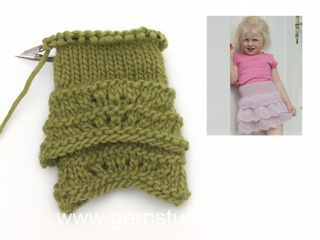 You can get the yarn to make this pattern from	10.80£. Read more. PATTERN: See diagrams A.1 and A.2. 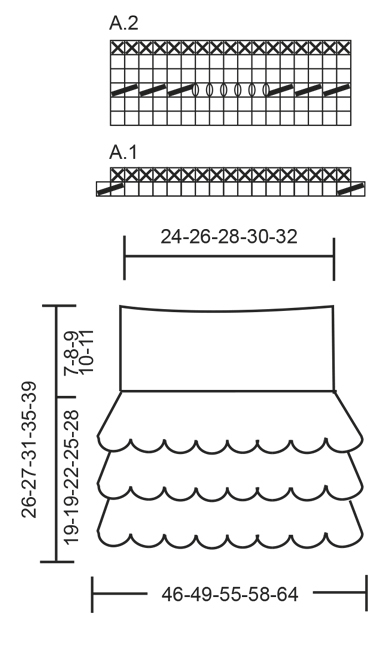 The skirt is worked in the round with circular needle. The lower part of the skirt is made up of 3 flounces which lie in layers on top of each other and are worked in Kid-Silk/Safran. Then rib is worked in Alpaca/Safran.. Cast on 285-304-342-361-399 stitches with circular needle size 3 mm and Kid-Silk/Safran.. Now work pattern in the round as follows: A.1 (= 19 stitches) 15-16-18-19-21 times in width = 255-272-306-323-357 stitches. Continue with A.2 (= 17 stitches) over all stitches. REMEMBER THE KNITTING TENSION! Continue with A.2 until the piece measures 7-7-8-9-10 cm (finish after a complete repeat). Now continue working in stocking stitch, AT THE SAME TIME on the first round decrease 37-38-44-47-51 stitches evenly along the round = 218-234-262-276-306 stitches. Work 6-6-7-8-9 cm stocking stitch over all stitches, on the last round decrease 28-30-42-28-44 stitches evenly along the round = 190-204-220-248-262 stitches. Lay the piece to one side. Cast on 247-266-285-323-342 stitches with circular needle size 3 mm and Kid-Silk/Safran.. Now work in the round as follows: A.1 (= 19 stitches) 13-14-15-17-18 times in width = 221-238-255-289-306 stitches. Continue with A.2 (= 17 stitches) over all stitches. Continue with A.2 until the piece measures 7-7-8-9-10 cm (finish after a complete repeat). Work 1 round stocking stitch where you decrease 31-34-35-41-44 stitches evenly along the round = 190-204-220-248-262 stitches. Lay flounce 2 on top of flounce 1 and work them together as follows: 1 stitch from the second flounce is knitted together with 1 stitch from the first flounce, do this until all the stitches are knitted together = 190-204-220-248-262 stitches. Work 6-6-7-8-9 cm stocking stitch over all stitches, on the last round decrease 50-56-60-76-78 stitches evenly along the round = 140-148-160-172-184 stitches. Lay the piece to one side. 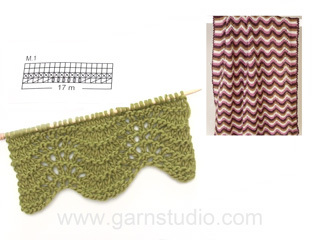 Cast on 190-209-228-247-266 stitches with circular needle size 3 mm and Kid-Silk/Safran. Now work in the round as follows: A.1 (= 19 stitches) 10-11-12-13-14 times in width = 170-187-204-221-238 stitches. Continue with A.2 (= 17 stitches). Continue with A.2 until the piece measures 7-7-8-9-10 cm (finish after a complete repeat). Work 1 round stocking stitch where you decrease 30-39-44-49-54 stitches evenly along the round = 140-148-160-172-184 stitches. 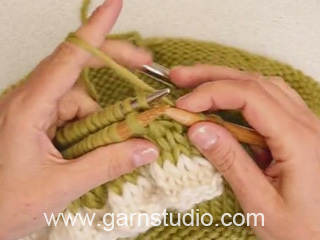 Lay the third flounce on top of the second flounce and work them together as follows: 1 stitch from the third flounce is knitted together with 1 stitch from the second flounce, do this until all stitches are knitted together = 140-148-160-172-184 stitches. Change to Alpaca/Safran and circular needle size 2.5 mm. Continue working rib in the round (purl 2/ knit 2). Cast off with knit over knit and purl over purl when the rib section measures 7-8-9-10-11 cm, the skirt measures a total of 26-27-31-35-39 cm. I would like to make this skirt longer maybe 5 -6 flounces, is there a way to do that? Dear Mrs Haimson, we are unfortunately not able to adjust every single pattern to every individual request. 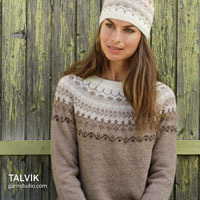 You are welcome to contact the store where you bought the yarn (even per mail or telephone) or any knitting forum. Happy knitting!